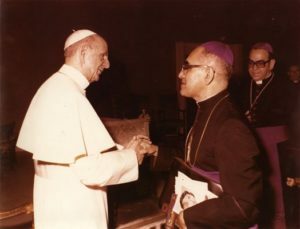 Two hugely influential figures in the recent history of the Catholic Church and Caritas Internationalis, Pope Paul VI and Archbishop Oscar Romero from El Salvador, become saints on 14 October 2018. Their canonisations will be celebrated by Pope Francis in St. Peter’s Square during the Synod of Bishops on Youth. Young people from around the world will be in Rome to celebrate the sainthood of the pope, who inspired the creation of Caritas Internationalis and the Italian Caritas, and Romero, the bishop of the poor and co-patron of Caritas. To mark the sainthood of these witnesses to faith and charity, Caritas Internationalis, Caritas Italiana and Caritas of Rome will hold a special event at the Marist Fathers’ San Leone Magno Institute in Piazza Santa Costanza in Rome on 13 October. Cardinal Luis Antonio Tagle, the president of Caritas Internationalis, will concelebrate mass in the institute’s chapel at 4 pm. At 6.30 pm young artists and migrants from different countries will take part in the concert , “The sound of your voice”, to be held in the institute’s auditorium as part of Caritas “Share the Journey” campaign. Pilgrims from every continent flocked to Rome in 1950, declared a Holy Year by Pope Pius XII. The year was marked by five great exhibitions that were to demonstrate to visitors from all over the world the work of the Church. One of them was on the activities of Caritas organistions in helping people caught in conflict. The Caritas exhibit was opened by Mgr. Giovanni Battista Montini, Substitute Secretary of State. This was before the Caritas confederation was formed. The Vatican had long wished to see closer international cooperation among as many Catholic charities as possible. In 1951, a meeting of the leading Caritas associations was initiated, again, by Mgr. Montini. 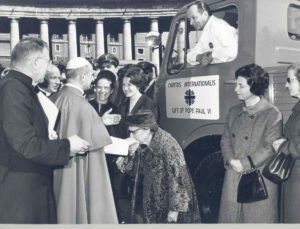 At the start of the convention, Montini proposed the creation of an “international organism” for managing cooperation between individual Caritas’s. His address would form the basis of a new set of statutes for a new organisation that would go on to become “Caritas Internationalis”. Mgr. Montini would go on to become Pope Paul VI, author of landmark Church teachings Populorum Progressio and Evangelii Nuntiandi and our founding father. “For us, Paul VI was the great light,” said Pope Francis. 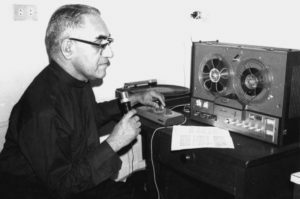 Archbishop Romero was shot dead on 24 March 1980, aged 62, while celebrating Mass. In the ensuing decade, some 70,000 Salvadorans were killed in the civil war. Caritas continues to work in El Salvador, helping farmers to improve their crops, assisting communities in reducing the risk of disasters, supporting people living with HIV, building peace in violence-stricken communities, defending human rights and trying to create a more just society.